Quite a few years ago I hosted what ended up being a huge Moroccan party. It started out as a Welcome Home party for an old camp friend, but turned into an extravaganza I’ve been loathe to even try topping ever since. To give you an idea of the scale of the thing, I purchased 68 yards of very, very inexpensive red and burgundy sateen fabric and turned it into a tent in the middle of my living room, suspended from the ceiling. No, I’m not joking. I already had a gorgeous Kashmir rug, so that fit the theme nicely. We moved all the furniture out, replaced it with huge couch cushions covered in other random Moroccan-esque fabric I had lying around (what? Don’t you have crates of fabric in your garage, too? ), turned on the sitar (ok, technically an Oud) music, tied a belly dancing skirt onto my then 7-year old daughter, and proceeded to feast for the next five hours. I think we had nine main dishes and eleven sides, not to mention more homemade baklava, Turkish coffee with orange blossom water, and mint tea than you can imagine. Oh, and the wine…I think everyone brought at least one bottle. Maybe two. Because hanging with your parents’ friends is uncool, the kids initially fled upstairs to escape the festivities. However, these are friends who volunteer at a summer camp I run. Ergo, they are exempt from the usual “old person” categorization of uncoolness in the kids’ eyes, so they quickly returned to the tent when they heard that one of their favorite male counselors was going to start belly dancing. Or maybe it was when they overheard their future stepfather say “uh, Danielle, you know that lantern you had hanging in the middle of the tent? While it looked nice suspended in mid-air by that fishing line, that stuff is flammable and you nearly burned down the whole tent.” Oh, whatever. It was still cool. Anyway, in the craziness of all the belly dancing and wine drinking, I neglected to notice that the kids were busily scarfing down from the various tagines and chafing dishes full of authentic Moroccan food. So while The Party preceeded The List, I did recently decide to revisit a couple of the dishes I suspected might be List contenders. Et voila, we arrived at #7. 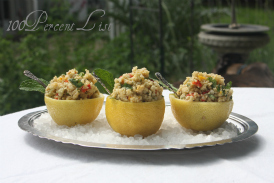 This Moroccan classic uses preserved lemons, something we keep in the fridge all the time thanks to our seriously overenergetic backyard lemon tree. I’m sure you can buy preserved lemons somewhere, but they’re so easy to make and I’m guessing much, much cheaper and obviously fresher than the storebought variety. Find the preserved lemon recipe I use here on the Martha Stewart site (feeling nostagic here, with a nod to Martha), or here on my site. 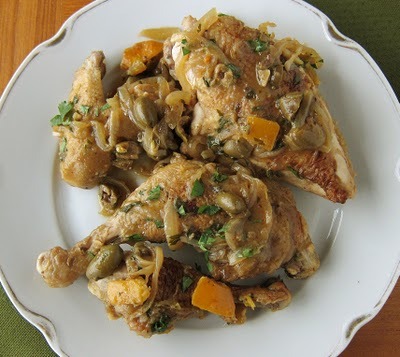 Find the Moroccan chicken recipe here on my site.